We missed the announcements of these animated films last year, but now we’ve found them thanks to Animation Magazine. Both are adaptations of popular children’s literature, and both of them are international co-productions. Dragonkeeper (based on a series of books by Carole Wilkinson) comes to us from China Film Group and Spain’s Dragoia Media. 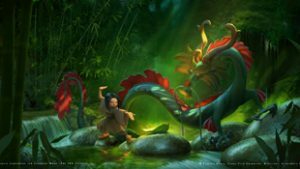 According to Variety, “Set during the Han Dynasty in a magic, epic and classic China… the first Dragonkeeper installment turns on the adventures of Ping, a slave girl so humble that she thinks she doesn’t deserve a name. Yet she finds the courage to become a true Dragonkeeper, helping the ancient last imperial dragon, Long Danzi, in its quest to transport a dragon egg across China to the coast, the only place it can hatch.” Then there’s Dragon Rider, based on the book by Cornelia Funke (Inkheart) and produced in cooperation between Germany and the UK. (It’s being adapted by Johnny Smith, writer for the original Gnomeo & Juliet.) Again, from Variety: “High-end by European standards, the 3D children’s fantasy adventure turns on Firedrake, a young silver dragon, Sorrel, a mountain brownie, and Ben, a human orphan who search among the highest Himalayas for the Rim of Heaven, which can offer sanctuary for Firedrake’s kin, whose valley is made uninhabitable by a dam.” No word yet on a planned release date for either film.